Oh, how we’ve awaited this release; salivating at the thought of what sights it has to show us, revelling in the idea that somehow Behemoth could top The Satanist and wondering if such a feat were even possible?! And then it drops, in your inbox, like an extreme metal ticking bomb which demands to be acknowledged instantaneously else its potency may be lost! That’s right, you bunch of blasphemous dogs, Behemoth’s I Loved You At Your Darkest Is Here and it demands your full attention. Too much enthusiasm? Not really. 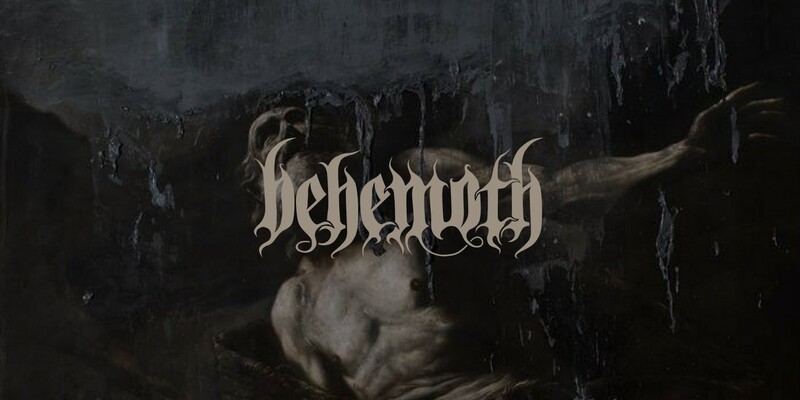 Behemoth’s rise to prominence has been a thrill to behold and they’ve transformed themselves into one of the most exciting, relevant and downright reliable extreme metal entities on the planet. So yeah, we’re excited about I Loved You At Your Darkest….and you should be too! First track proper is “Wolves Ov Siberia” and it proves to be perfect single fodder. Snarling out of the traps, foaming at the mouth and shredding skin from bone, Behemoth sound suitably feral and they waste no time in unleashing merry hell. “God=Dog” is next and it’ll always be a clumsy title, but fortunately the music is anything but ungainly with Behemoth rattling through their impious and profane diatribes with typical aplomb. Everything is amped up to the max and Behemoth sound mighty, propelled by years of hard work which has seen them rise above each and every challenge with unshakable persistence, and a steadfast belief in their own modus operandi. It’s notable just how succinct Behemoth are on this album, with the majority of songs refined to the nth degree; all fat rendered and as lean as Nergal himself. It’s also important to note just how epic these songs sound even when reduced to just 2 – 3 mins in length and Behemoth are clearly thinking of their future (“We Are The Next 1000 Years”alludes to that!) in structuring I Loved You At Your Darkest in this manner. With relatively clean passages taking centre stage in virtually every song, their extreme blackened death metal merges seamlessly with a more traditional sound and a sense of crossover appeal pervades through each track. In fact, remove the growls and “Bartzabel” could come from Ghost’s debut Opus Eponymous, such is its morbidly pervasive – and generally harmonious – appeal. There’s such a sense of transcendence to I Loved You At Your Darkest that comparisons with Emperor’s Prometheus: The Discipline of Fire & Demise, Morbid Angel’s work on Covenant (particularly the ‘experimentation’ of “God Of Emptiness”) and Opeth, Gojira and Mastodon’s ability to carve their own path becomes relevant. Behemoth are no longer a band tied to genre trappings; they are an entity within their own sphere of influence and have become one of the all time greats in the process! Is I Loved You At Your Darkest as good as The Satanist? That’ll depend on your love for that particular masterpiece and, right now, we are erring on the side of no; it’s not quite in the same league (with Satan) as 2014’s meisterwork. However, I Loved You At Your Darkest is still a masterful follow-up to one of the 00’s defining extreme metal releases, and should see Behemoth extend their tentacled reach ever further into the realms of headlining acceptability. Behemoth’s I Loved You At Your Darkest is due for release on October 5th via Nuclear Blast. It can't be as bad as you think it is, right? !